- Activity play mat folds instantly into a portable toy storage bag, just pull the drawstrings! - Shoulder straps makes it easy to hang out of the way or carry with you anywhere like to picnic, camping,beach party or even on a trip. - The durable fabric makes it easy to clean even after a trip to the beach, simply wipe it or wash it in cold water. - Mumy's good friend. Use this to make sure your child is having fun without worrying about the mess. Made of strong nylon material make this kid's activity mat the ultimate in smart, no-hassle storage. 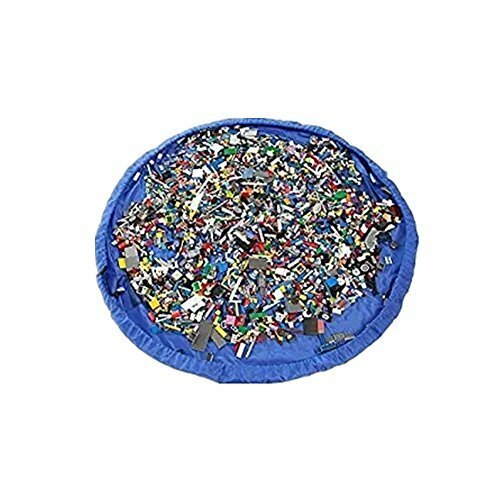 The bag starts as a huge floor mat that extends out to 60" /17" offering plenty of space for your kids to spread out their toys and play. After games,you just need a quick pull of the drawstrings, cleanup is complete! Not only for home use but also great for outdoor picnics, camping, going to the beach and more. Extra durable fabric will make it easy to clean by simply wipe it or wash it in cold water with gentle cycle,air-dry. If you have any questions about this product by Hever, contact us by completing and submitting the form below. If you are looking for a specif part number, please include it with your message.